Walking through the entrance of the Intercontinental Hotel, one cannot ignore the history that this building is steeped in. Built around the restored Treasury Building of 1851, the hotel is a dynamic mix of tradition and modernity. Three tiers of sandstone arcades create a soaring atrium that, tonight, are beautifully illuminated, creating an atmospheric and moody surrounding. Slender women in ballgowns delicately rearrange their styled hair while sipping champagne (Veuve Clicquot, I’m sure) in the hotel lobby and I’m suddenly conscious of my somewhat un-ballgown-esque attire. But, fortunately, I’m quickly assured that they are attending an upstairs charity ball and that I am most adequately dressed. Phew. As I wait for the lift to go to Cafe Opera, I’m mesmerized by the opulence of the hotel building and on entering Cafe Opera, I’m not disappointed. Antique mirrors, marble flooring and high ceilings are in keeping with the hotel’s luxurious vibe. This, combined with customer service that in today’s world I thought was purely reserved for royalty, conjures thoughts of an era when people took time to dine. When a meal wasn’t simply a process of feeding a hungry tummy. But modern touches, such as the market-style chalkboard with handwritten buffet specials and the live cooking stations, remind me that, yes, we are in the 21st century. But these are not unwelcome reminders – especially after sampling grilled lobster, which charming young chefs cook right in front of you. 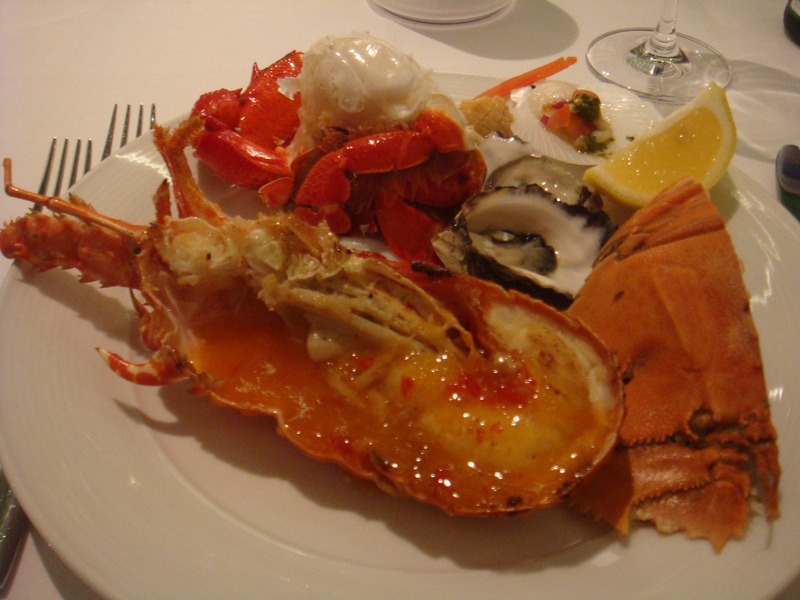 Catching glimpses of Sydney Rock oysters, Crystal Bay prawns and Balmain Bug, I don’t hesitate in selecting for the buffet entree. I must admit, I’m the first person to turn my nose up at a buffet-style restaurant but this cannot even be considered in such a category. Diners peruse the stainless-steel food stations, scrutinising over salmon sashimi, slow roasted shoulders of lamb and steamed scallops. The food is presented immaculately and waiters flutter around like angels, clearing plates and suggesting wines and dish combinations. 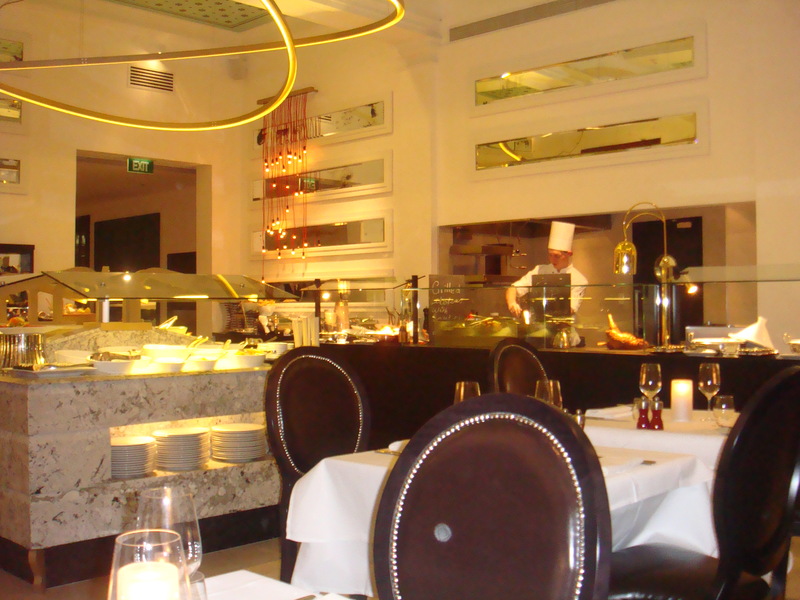 The French inspired a la carte menu is fine-dining on every level. The pan-seared line-caught barramundi is perfectly seasoned and while the fillet is small, it’s still moist and succulent. Organic glazed carrots perch on top of the fish and a sophisticated mussel emulsion presented in the form of an aerated mousse takes the dish to another level. My only complaint is that my stomach isn’t as big as my eyes.